San Francisco, Zephyrus Image, 1970. Untitled [All Power to the People]. 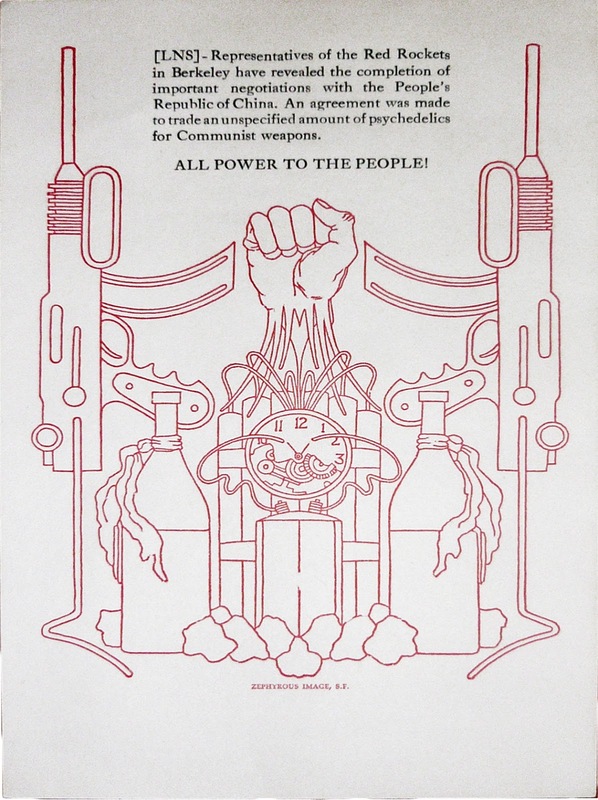 Michael Myers and Holbrook Teter were the principal artist/activist/printers of Zephyrus Image, a radical press that operated in San Francisco and Berkeley through the 70s and as active in arts, poetry, politics and protest. Their workmanship was impeccable with a great graphic quality, good paper, and all the hallmarks typical of “fine printing” but Zephyrus Image was the furthest thing from some highbrow poetry press churning out stuffy chapbooks. Much of their work was distributed directly to public as a kind of dada-inflected street performance or disguised as "real" products or advertisements and surreptitiously placed on racks in stores or slid into stacks of yet-to-be sold newspapers. Their work has a directness and clarity that pointedly contrasts with the loose trippiness of the psychedelic era and both Myers and Teter were equal opportunity satirists who clearly enjoyed tweaking the freaks as much as the squares. 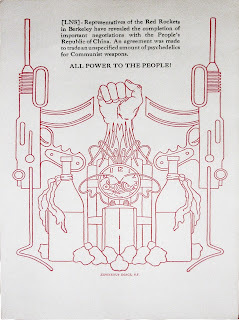 Myers’ linocut image of a fist rising from a tableau of Molotov cocktails, dynamite and machine guns is among the most famous images produced by the press, and was worked in to various other designs later as a kind of calling card for the press. 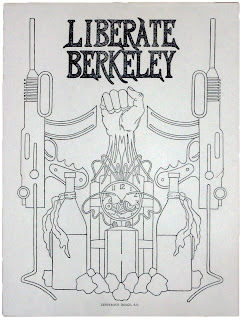 Myers’ intent using this incendiary imagery was at least partly ironic, obliquely pointing out that the ubiquitous calls for liberation issued from Berkeley were almost always seeking armed struggle in someplace far away. 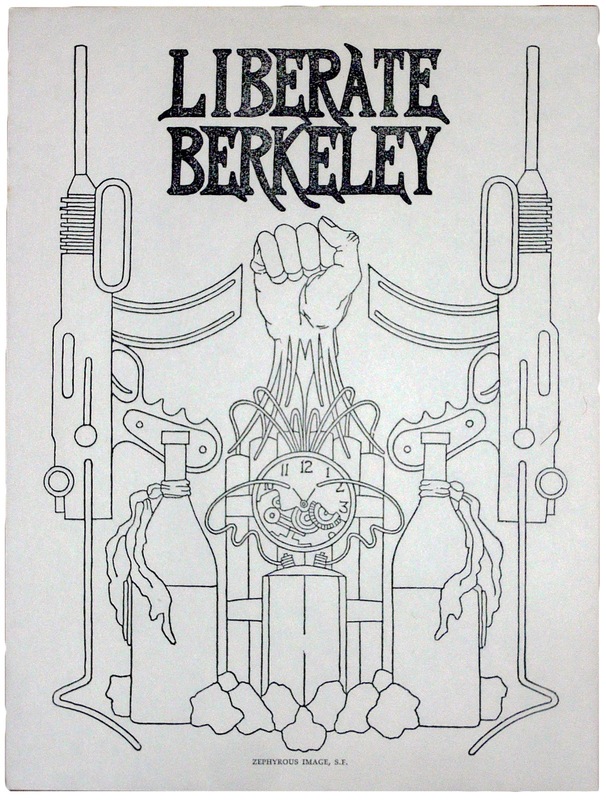 Liberate Berkeley is one of the imprint’s earliest printings, so early in fact that Myers and Teeter had not yet finally settled on the spelling of the press’s name, which is printed “Zephyrous” here. Untitled [All Power to the People] was printed not long after.